The most important part about bringing up a vegetarian baby is to ensure that he gets enough protein and iron in his diet. In the absence of meat, a diet of nuts and vegetable proteins runs the risk of being too low in iron. You can avoid this by feeding your baby iron-rich foods, including lots of dark leafy greens vegetables, iron-fortified breakfast cereals, beans and lentils. If you are raising your baby on a vegan diet, you may need to give him extra vitamin supplements, such as vitamins D and B12, to ensure he receives the necessary nutrients for growth. Including fortified foods in your baby's diets will also help round out his nutritional intake. Always consult with your paediatrician if you are unsure about what foods to feed your baby. A vegetarian baby diet will almost certainly include a lot of pulses, which has the positive side effect of being kind to your wallet! Pulses are a cheap and low-fat source of protein, fibre, vitamins and minerals. A pulse is an edible seed that grows in a pod and includes lentils, beans and peas. A vegetarian diet does not have to be boring! You can still introduce a vegetarian baby to a wide variety of tastes and flavours without having to feed him meat. The selection of recipes below include main and side dishes made using non-meat ingredients. This is by no means a comprehensive list - please check out my baby soup recipes for many more vegetarian recipes. 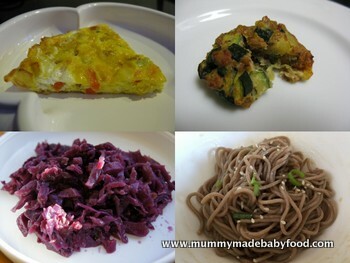 There are also a number of vegetarian options to choose from amongst the baby finger foods and quick pasta recipes. Remember that it is best not to add any salt to baby’s food before the age of 1, so if you are cooking for older children or for the family, set aside baby’s portion first before seasoning. So tasty that these are known as courgette 'cakes' in my household! A delicious and satisfying recipe that you can vary to your heart's content. This is a nice way to eat avocado while also being a healthy introduction to food dips. Quick and easy, this recipe is another variation of the frittata. Ideal for a light meal, this dish is perfect for the warmer weather months. A comforting side dish, especially when paired with roast meats. A healthy alternative to sugar-laden commercial varieties, this recipe is so yummy that your little ones will never suspect it is sugar-free. An easy way to introduce babies to plant-based protein sources.